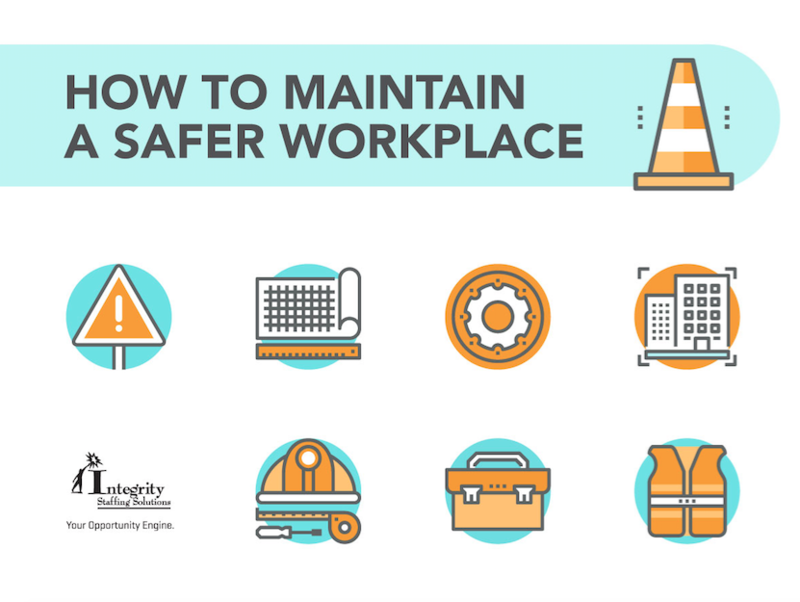 When it comes to workplace health and safety, an ounce of prevention is definitely worth a pound of cure. In other words, the consequences of an accident are far more expensive than keeping it from happening in the first place. At Integrity, we partner fully with our clients to ensure that best safety practices are in place at the job sites where our associates are assigned. In fact, we have our own OSHA certified staff experts, who offer this advice for a successful health and safety program. Invest time, money and effort in the program. Hold meetings to discuss employee safety and health. Provide for training refresher courses at regular intervals. Ensure that medical aid or supplies appropriate to your industry are accessible. Invite suggestions for risk reducing equipment or processes. Establish a system for reporting hazards and correcting them. Administer a comprehensive training program for all workers. Assigning responsibility for hazard awareness to managers. Learning new equipment and/or operations. Using and maintaining person protection equipment. Dangerous areas and jobs only accessible by trained, authorized individuals. Equipment regularly inspected and maintained. Breakages, spills and other hazardous incidents immediately rectified. Objective analysis from outside health and safety experts. If you'd like personalized assistance with your risk reduction measures, Integrity offers a FREE site safety inspection. Contact us to set up an appointment.